This blog has so many twists and turns it is really difficult to know where to start. While researching how Palm Beach County acquired the land that would become Palm Beach State College, John Prince Park, and Lantana Airport, I found an article that stated the western border of the acquired land was “Deweese Road.” That had me stumped as there is no Deweese Road on a current map. After researching the Palm Beach Post archives, a much more complex story began to unfold. It made me realize once again how much things have changed, the past paved over and forgotten. 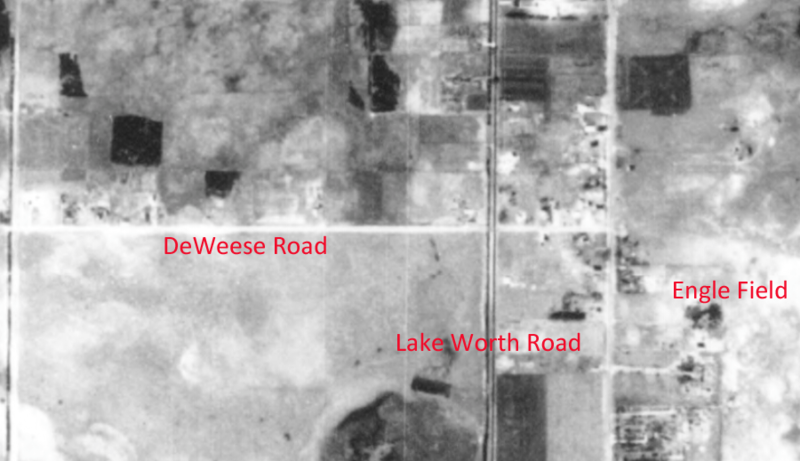 Deweese Road was a dirt road that went from Second Avenue North to what would become Sixth Avenue South in Lake Worth. As the Depression took hold, Palm Beach County had federal Works Project Administration (WPA) money for road improvements. 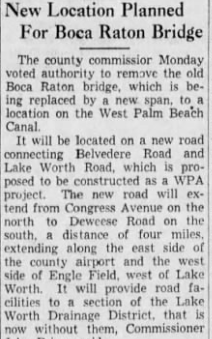 According to an April 11, 1939 Palm Beach Post article, a new road would be built with WPA funds that would extend the existing Congress Avenue, from Belvedere Road to Lake Worth Road, some four miles. Engle was Arthur B. “Pop” Engle, born in 1880 in West Virginia. He and wife Emilie had purchased a tract of land in April of 1937 from J.I. Keller to open his own private airport for small planes and flying lessons, mostly using Piper Cub aircraft. 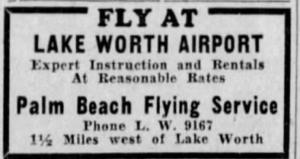 Many articles refer to the place as “Engle’s Field” or “Lake Worth Airport.” According to the obituary for Emilie Engle, who died in 1984 at the age of 96, the Engles came to Lake Worth in 1922 and operated an ice plant and managed the LaVerne Apartments. They were flying enthusiasts, and taught hundreds of new pilots to fly. It became more difficult to operate a private airport during World War II, due to the need for armed security. The 1949 hurricane destroyed what was left of the airport. Finally, the Engles sold the property in 1953 and it is now the Englewood Manor subdivision east of Congress between Second Avenue North and Tenth Avenue north. Back to Deweese Road. That name stuck until the late 1940s – many references to selling livestock, chickens and other farm goods were found in old classified ads. 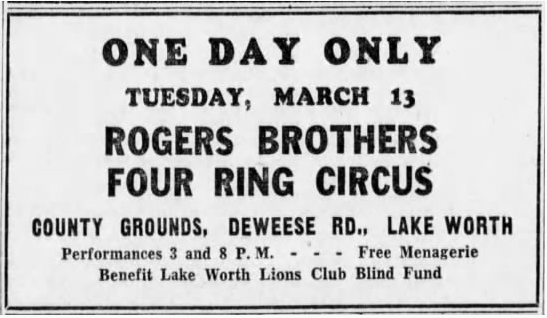 Even a circus stopped by, held on the present day site of Palm Beach State College in 1951. A 1940 Department of Agriculture photo shows Deweese Road and some of the airfield buildings along Second Avenue. The Deweese family did have many heartaches over the years; their house burned to the ground in 1931, and their 32 year-old daughter Flora died in 1944 of a sudden illness. George Deweese also knew sign language as he was asked to be an interpreter in court in a case involving hearing impaired litigants. In later years, the Deweese Road name was lost to Congress Avenue, as Congress was expanded through the years to stretch all the way to Yamato Road in Boca Raton, through what was then cow pasture and woodlands as it meandered south. Both the Deweeses and the Engles are interred at Lake Worth in Pinecrest Cemetery. 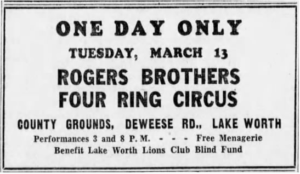 Very few, if any, persons living in Lake Worth today would have any memory of these places. 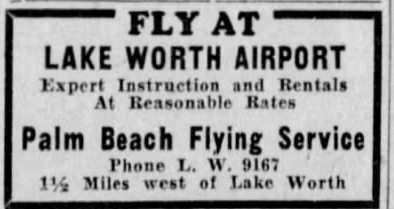 But next time you venture down Congress, think of the vast open spaces of what was considered the “country” part of Lake Worth.